Aerodrums is an amazing new kind of silent percussion air-drumming instrument and can achieve everything that a real drum set can do without spending time carrying around and setting up a physical drum kit, enabling you to drum without a physical drum kit, by making air-drumming gestures. Aerodrums runs on your computer and understands your drumming intent by watching you drum through a high speed camera. It's flexible and highly extensible enabling you to create and configure your own Aerodrums drum kit, use your own sound samples and trigger your drum sampler or Digital audio workstation via MIDI. Play drums when and where you want with Aerodrums. (The required camera is included in the Aerodrums package). 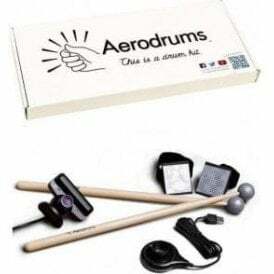 Buy the revolutionary Aerodrums online at Footesmusic, browse the full range and get Free UK Delivery on orders over £100.